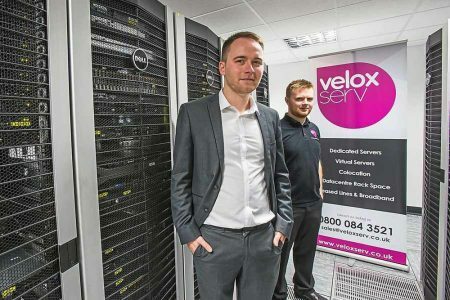 Exceptional sales growth has seen VeloxServ Communications Ltd open a new Midlands data centre in Wolverhampton. The new facility is housed in a dedicated building and quadruples VeloxServ’s capacity for server and rackspace colocation,as well as dedicated and virtual server services. VeloxServ’s new Midlands data centre has been created by converting a former industrial building into a dedicated hub for Information Technology services. Over £200,000 has been invested in digital and physical security measures, as well as equipment to ensure uninterrupted power and network connectivity supplies. The investment represents a major milestone for the business, which was founded eight years ago by Craig Messer. It has grown from a soletrader venture into a business operating datacentres in Wolverhampton and London, supporting clients ranging from small website design agencies to national retailers. Businesses interested in finding out how VeloxServ’s services can support their Information Technology needs can do so by visiting www.veloxserv.co.uk or calling 0800 084 3521.